Here are some snazzy birthday facts about 3rd of June 1980 that no one tells you about. Don’t wait a minute longer and jump in using the content links below. Average read time of 10 minutes. Enjoy! What day was my birthday Jun 3, 1980? June 3, 1980 was a Tuesday and it was the 155th day of the year 1980. It was the 23rd Tuesday of that year. The next time you can reuse your old 1980 calendar will be in 2036. Both calendars will be exactly the same! This is assuming you are not interested in the dates for Easter and other irregular holidays that are based on a lunisolar calendar. 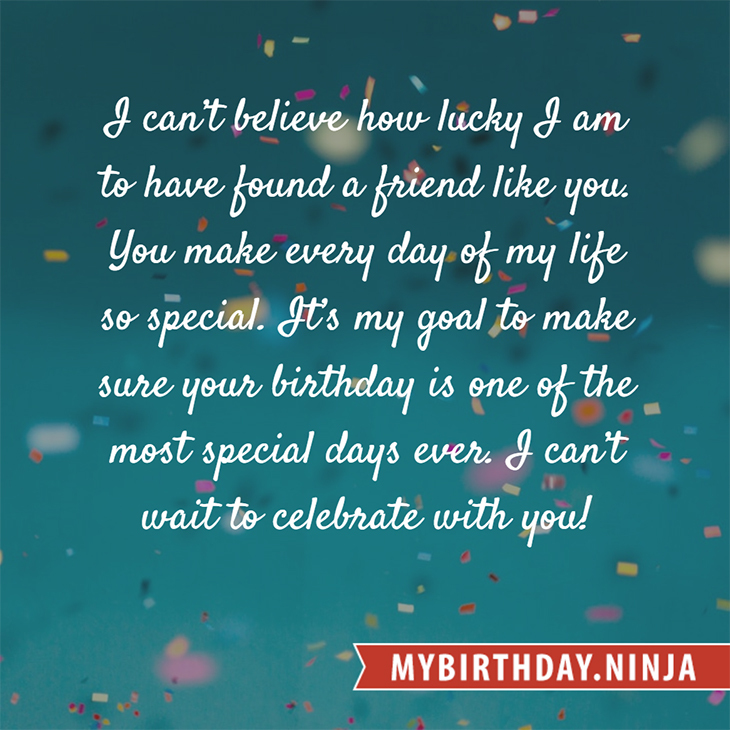 There are 43 days left before your next birthday. You will be 39 years old when that day comes. There have been 14,201 days from the day you were born up to today. If you’ve been sleeping 8 hours daily since birth, then you have slept a total of 4,734 days or 12.96 years. You spent 33% of your life sleeping. Since night and day always follow each other, there were precisely 481 full moons after you were born up to this day. How many of them did you see? The next full moon that you can see will be on May 18 at 21:13:00 GMT – Saturday. Fun stat: Your first one billion seconds (1,000,000,000) happened sometime on February 10, 2012. If a dog named Teebone - a Yorkipoo breed, was born on the same date as you then it will be 172 dog years old today. A dog’s first human year is equal to 15 dog years. Dogs age differently depending on breed and size. When you reach the age of 6 Teebone will be 40 dog years old. From that point forward a small-sized dog like Teebone will age 4 dog years for every human year. The poem “Casey at the Bat”, by Ernest Lawrence Thayer, is published in The San Francisco Examiner. Franz Rademacher proposes plans to make Madagascar the “Jewish homeland”, an idea that had first been considered by 19th century journalist Theodor Herzl. A plane carrying 153 people on board crashes in a residential neighborhood in Lagos, Nigeria, killing everyone on board and 10 people on the ground. At least 119 people are killed in a fire at a poultry farm in Jilin Province in northeastern China. What does my birthday June 3, 1980 mean? Your birthday numbers 6, 3, and 1980 reveal that your Life Path number is 9. It represents selflessness, forgiveness and creativity. You are the philanthropist, humanitarian, socially conscious, and are deeply concerned about the state of the world. The following celebrities also have the same life path number: Mark Lindsay Chapman, Carlo Bergonzi, Dave Navarro, Sarah Hyland, Matt Bomer, Nils Poppe, Michiru Ōshima, Diablo Cody, Joanne Borgella, Lisa Gleave. 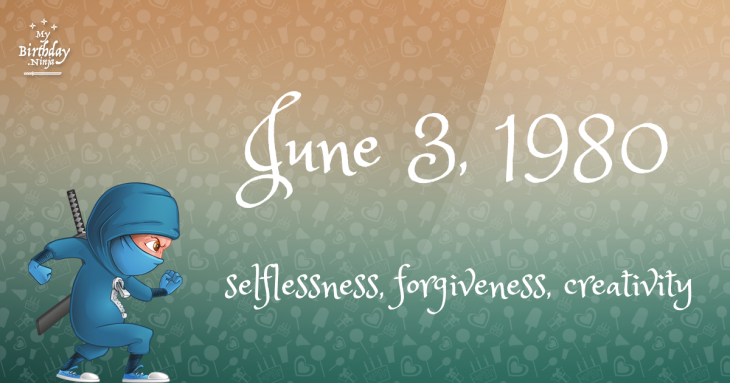 What is the birthday horoscope for Jun 3, 1980? The Western zodiac or sun sign of a person born on June 3 is Gemini ♊ (The Twins) – a mutable sign with Air as Western element. The ruling planet is Mercury – the planet of communication. According to the ancient art of Chinese astrology (or Eastern zodiac), Monkey is the mythical animal and Metal is the Eastern element of a person born on June 3, 1980. Fun fact: The birth flower for 3rd June 1980 is Rose for devotion. What is the Love Match for Jun 3, 1980? When it comes to love and relationship, you are most compatible with a person born on October 24, 1974. You have a Love Match compatibility score of +127. Imagine being in love with your soul mate. On the negative side, you are most incompatible with a person born on February 21, 1966. Your incompatibility score is -173. You’ll be like a cat and a dog on a love-hate relationship. Arf-arf, I want to bite you. Meow-meow, stay away from me! The number-one hit song in the U.S. at the day of your birth was Funkytown by Lipps Inc as compiled by Billboard Hot 100 (June 7, 1980). Ask your parents if they know this popular song. I do not know how you feel about this, but you were a male ♂ in your last earthly incarnation. You were born somewhere around the territory of Ukraine approximately on 825. Your profession was leader, major, captain. How many babies were born on June 3, 1980? Base on the data published by the United Nations Population Division, an estimated 125,148,676 babies were born throughout the world in the year 1980. The estimated number of babies born on 3rd June 1980 is 341,936. That’s equivalent to 237 babies every minute. Try to imagine if all of them are crying at the same time. What is the popular baby name on 3 Jun 1980? Here’s a quick list of all the fun birthday facts about June 3, 1980. Celebrities, famous birthdays, historical events, and past life were excluded. Try another birth date of someone you know or try the birthday of these celebrities: March 1, 1994 – Justin Bieber, Canadian singer-songwriter, dancer, and actor; October 2, 1973 – Efren Ramirez, American actor and producer; April 1, 1985 – Josh Zuckerman, American actor.